Perfect for budding young chefs looking to cook with confidence, this book will help make sure all your meals hit the spot. 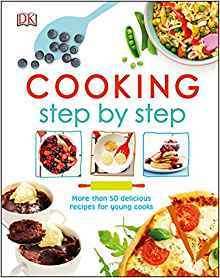 Cooking Step by Step is packed with 50 mouthwatering recipes that are easy to make and tasty enough for the whole family to enjoy. Recipes include kid and family favorites such as pizza, quesadillas, lasagne, meatballs, vegetable stir-fries, and more! Kids will also learn, tips, tricks, and kitchen fundamentals-all while having a great time making simple snacks, balanced meals, and sweet treats.